The SN74HC139 (74139) IC provides two individual 2-line to 4-line decoders in a single package. The decoders take as input a two digit binary number 1 thru 4 (00, 01, 10, 11) and output by selecting one of four lines. 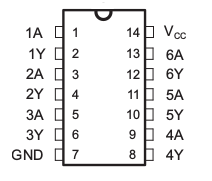 This SN74HC139 example circuit uses the first decoder on pins 1-7. 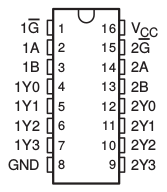 Inputs are pins 2 and 3, and the outputs are pins 4 to 7. Pin 1 is the enable. If the enable is inactive then no outputs are active regardless of the state of pins 2 and 3. 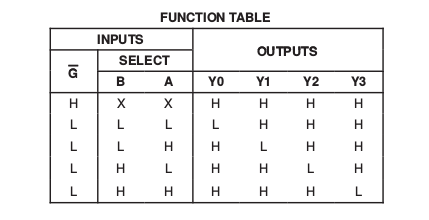 The pinout and functional output table from the SN74HC139 datasheet are provided below. The SN74HC139 is an active low device, meaning that for both the inputs and the outputs, a low voltage indicates logic 1 and a high voltage indicates logic 0. The example circuit uses LEDs to indicate which of the four output lines is active. A SN74HC04 (7404) hex inverter is used to invert each of the outputs, converting the active low logic to active high logic, and illuminating the LED fed by the active output.